This weekend I hosted a couple's shower for my good friends who are getting married in two months! 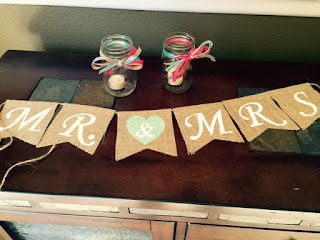 Couple's showers and coed engagement celebrations are becoming more and more common as gender roles equalize, allowing the groom to join in on the celebration and providing both members of the couple with an opportunity take a part in collecting gifts to set up their household together. Couple's showers are a great way to involve both the bride and groom's friends and family equally, and a fun idea for couples who wish to break away from tradition. The bride and groom are having an out of state wedding and were excited to celebrate with their Santa Fe friends and coworkers who are unable to attend the wedding. It was an afternoon event on a warm, sunny day. The decor consisted of burlap table runners and bows, teal and fuchsia accents, and succulent center pieces, to parallel the couple's wedding theme. I'm on a mission this summer to discover light and delicious desserts with all the fruity and bright flavors of the season. 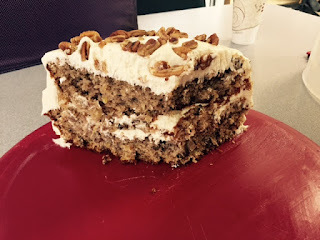 Last month I made the traditional St. Louis Gooey Butter Cake, and this month I bring you carrot cake's fruity southern cousin, Hummingbird Cake! Hummingbird Cake was first introduced in Southern Living in 1978, and since that time a variety of recipes have evolved, some containing vanilla pudding and applesauce, some that are eight (!!!!) layers tall, and others in a bundt pan. I was really satisfied with this yummy variation from my favorite blogger, but next time I'm going to try adding lemon zest to the frosting, and shredded coconut for a more Hawaiian flavor. This past weekend was the Live.Love.Tri all women's triathlon in Rio Rancho. What a fun event! I really like all women's races, especially when there are a lot of beginners and first-time racers, because there seems to be a strong sense of camaraderie and support. I got to the race site at 5:45 a.m., just as the sun was beginning to rise over Sandia peak. The event was well organized (and there were lots of clean bathrooms, bonus!). We had a fun pre-race warm up with yoga and Zumba, followed by singing the National Anthem together. Racers were in good spirits and it was sunny and warm when the race started at 7:00. Race season is in full force in our household! Jaycob is competing in the Xterra Mountain Championship off-road triathlon in Beaver Creek next weekend, while I'm doing a women's sprint triathlon in Rio Rancho. When it's race week, we are all about the carb loading. Some of our favorite pre-race dinners are spaghetti with turkey meatballs, and spicy chicken rigatoni, but I recently discovered this yummy recipe from Runner's World! In honor of the city of Marathon (where a man ran 26.2 miles from Marathon to Athens to announce the defeat of the Persians in an ancient battle, hence the distance of what we now call a "marathon"), Marathon pasta is made up of truly Greek ingredients. You can add some chicken or seafood for a little extra protein.